This coin celebrates the 10th anniversary of the introduction of the Euro. Five designs were created to celebrate the 10th anniversary and EU citizens could vote online to select one of these designs. Over 35.000 EU citizens voted and the design adopted was that of the Austrian Helmut Andexlinger. The Euro sign is shown partially surrounding a globe representing the earth. This symbolizes the rise of the Euro to an international currency. The people on the globe represent the EU population. The ship stands for trade, the building with the Euro sign for the financial world. Industry is represented by a factory progress by some wind turbines. The mint mark is seen just after the year 2012 at around five o’clock. Note: This design is for the joint issue for the 19 EU members having the Euro as their currency. Andorra,Monaco,San Marino and the Vatican, although they have the Euro as their currency are not members of the EU. San Marino "cheated" in that they simply took the joint issue motif and used this for their own independence commemorative issue. 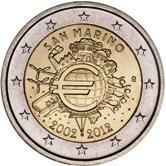 Return from San Marino Commemorative 2012 to euro coin collector.